Last fall I wrote about this very nice software product called RoboGEO which lets you take a GPS track and photos you take with your camera and automatically georeference the photos. RoboGEO was at version 2.1. In just the last few months RoboGEO has gone to version 4.0, and just released a beta for version 4.1. See a complete list of feature enhancements. This is the best application I've used for getting location information for your photos. RoboGEO will automatically stamp your location information either into the EXIF data for your digital photos, or even interface with Flickr and generate the geo tags for your Flickr copies of your photos. RoboGEO has an excellent export capability to Google Earth. 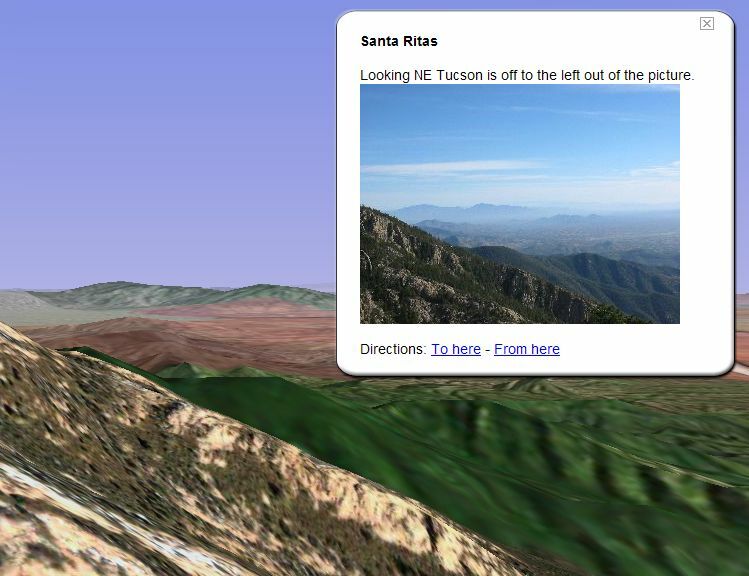 This GE file of a backpacking trip in Arizona (Note: 2 Mbyte file size because it includes photos) is just one example of RoboGEO's GE capabilities. Read more at the RoboGEO web site. RoboGEO pricing starts at just $34.95 for a personal license.